In the scientific world, nothing is truly fact until it has undergone significant testing with rigorous standards. Try and tell a scientist that results in rats are “good enough” and you’ll be laughed at. Really, randomized, double-blind placebo studies are considered solid. They are done on humans and done in such a way as to reduce the chances of results being nothing more than an anomaly. I say all of this to introduce a new study showcasing how ginger truly is a cancer-fighting food, a study that couldn’t get much better. For the study, which was published in the PubMed journal of the National Institute of Health, scientists with Atlanta’s Emory University used a group of 20 people who were considered high risk for colorectal cancer. The patients were randomly placed in two groups, 10 who would receive ginger and 10 who would receive a placebo. Those who received the ginger took only 2 grams of ginger for 28 days. They were then rigorously tested for markers that indicate high risk of colorectal cancer. Biopsies were taken and blood work was done. What the scientists found was those who took ginger were significantly better than those who didn’t. The scientists admitted, “ginger may reduce proliferation in the normal-appearing colorectal epithelium (lining) and increase apoptosis and differentiation relative to proliferation.” What does this mean? Basically, that ginger can increase cancer cell death and reduce the spread of cancer cells. This isn’t the first study to portray ginger’s cancer-fighting abilities. Another study found ginger to reduce prostate tumor size by 56% in mice. Sure, the study wasn’t done on humans, but that doesn’t necessarily mean they wouldn’t be reproduced. So, do we need to wait for more research to start reaping the cancer-preventing benefits of ginger? Hardly. 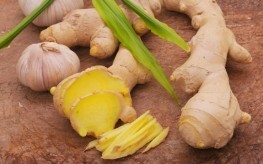 Ingesting two grams of ginger is easy when you can use it in tea, smoothies, and a variety of culinary creations. Just rub it on or use a very fine grater. It's delicious if you don't use too much in rice dishes, salads, and soups! I am a novice to ginger but have tried using it lately. Can you tell me the best way to use it? I am experimenting with chopping and grating and it seems so difficult to get it into a recipe …. awfully stringy. Ginger can be used liberally in stir-fry cooking with organic veggies, and it is great when made into a simple tea, sweetened with stevia or RAW Honey. I started adding raw ginger in my juice extractor drink each day and I no longer suffer from arthritis pain. It’s like 95% gone and I no longer need to take Vicodin and Aleve to manage pain. Ginger is truly amazing! Just had my morning serving of fresh Ginger! And yes, I do believe it makes a difference. Ginger, Turmeric and their yet to be discovered cousins (unknown in the West) have immense healing powers externally and internally. We use some of them daily for treatment, reversal cure of Pain & Inflammation. Their natural healing powers have been known and applied for hundreds of years trough S.E.A. What are the ‘yet to be discovered cousins (unknown in the West)’ of Ginger and Turmeric? I’d love to know. My husband and I take Ginger and Turmeric every second day or so in a fresh squeezed lemon drink and I love to include other yummy things in it. The best way to take tumeric (curcumin) is to make a tea using 1/4 tsp tumeric, 1 or 2 tsp organic coconut oil (this is important as it helps the body gain the most benefit and incorporate the tumeric easily) add a dollop of RAW Honey to sweeten or stevia if you prefer non-caloric sweetness. Take once a day as a preventative for cancer and inflammation, or three times a day if you have cancer, to suppress tumor growth. It works. I’m using it now.